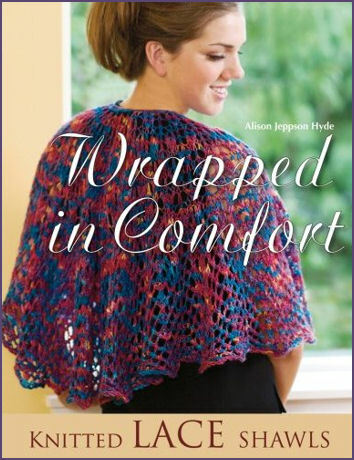 This week I received my copy of Wrapped in Comfort: Knitted Lace Shawls by Alison Hyde. I’ve had the pleasure of getting to “know” Alison over the last several years, thanks to the Internet, and the various mailing lists we’ve been on over time. I always love hearing her stories of her knit scarves and shawls, and how they somehow find their way to just the right person at the right time. She has a knack for that. I’m so glad Alison wrote this book! Ok, I’m so NOT a lace knitter, but this book makes me want to try. The patterns are clearly presented in written form as well as in charts, which is great for me since I don’t do charts very well. But the cool thing about this book is that it’s not just a great collection of beautiful patterns from the heart. It’s not just a knitting book. It’s also ABOUT the knitting. Each pattern has a story, and Alison included the story of the pattern, and the person it was for, or the situation in which it was created. Not only do the shawls and scarves presented in the book wrap the recipient of the objects in comfort, but the book does this as well. It is, indeed, a “comfort read” for knitters. Way to go, Alison! And thanks for sharing so much of yourself and your talent with the rest of us. Do not adjust your monitors! This is what my children wanted to eat for lunch today. Really. 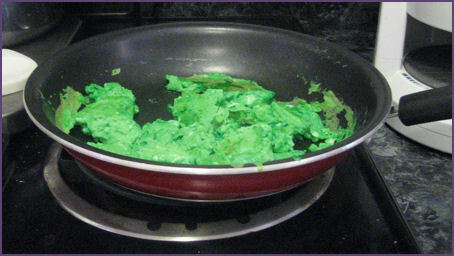 My daughter even cooked them herself. Just thought I’d share!! In my knitworld, I’m still knitting away at the baby blanket pictured in the entry just before this one. I’d post a photo, but it wouldn’t be too different from the last one. So that one will have to do for now. Maybe next week I’ll post an updated picture. 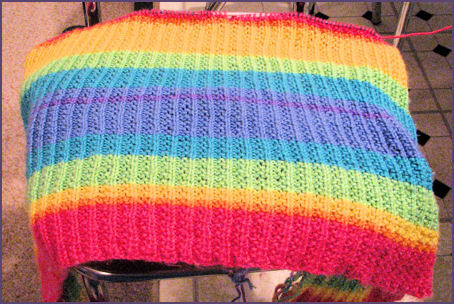 Well, it’s been a while since I’ve written an actual post, so I thought I would show an update on my progress with the rainbow striped blankie I’m working on. It’s finally starting to look like a blanket! But alas, I have a long way to go! Ok, it’s crazy to go in August, but the kids don’t have day camp then and we’d need to take off anyway to take care of them. I’m going to try to be “good” when we go there, but I hear that they don’t let people in wheelchairs ride the wheelchair accessible rides unless you get out of your own wheelchair and ride in one of theirs. This of course assumes that the wheelchair user can actually stand up or move easily, which hey, might apply to some people in wheelchairs, but leaves a lot of folks out, sweating in the heat. Something tells me I’m going to get lots of knitting done on this trip! I am listening to several podcasts this summer. My favorites are of course Cast On, the KnitPicks Podcast, and Stitch Stud and his Bride. Of course I am partial to Cast On, and what fun! Brenda Dayne is taking her listeners to “camp” this summer! I shall enjoy this immensely while knitting by the pool. I admit to being secretly envious of all of those knitters who attend knitting camps, cruises or other events, and maybe this series will help me to feel a sense of community even when I am knitting in solitude. I do have to say that even though it is hard for me not to view the KnitPicks podcast with a degree of skepticism, given that after all, they sell the products they rave about, it is very well produced and fun to listen to. And stitch stud? So far I’m just enjoying the “guy” perspective on knitting. Check these out! All three are great things to knit by, and no, you don’t need an iPod to listen. I’m still busily adding my old blog entries into the new blog system, but so far so good! If you did happen to link to these things before, thanks! And now you have updated bookmarks. Of course I am still busily working on my stripey baby blanket. It has most of a new band of yellow on it and I am hoping to start the next color soon. I’ll post a new pic later this week. Until then, happy knitting! Please be patient while I update my old blog to the new WordPress format! Today has been a rather blustery day as we experienced the remnants of Tropical Storm Barry. So rather than having a typical knit-by-the-pool summer afternoon, we took the kids to see Shrek the Third. Actually it was their idea to take Daddy to see Shrek for his birthday. Wasn’t that nice of them? 🙂 We’d be lying though if we did not say that we also enjoyed this latest installment from Far, Far Away. In fact, there’s plenty of humor for all age levels, and we enjoyed it a lot! I got a new book this week! 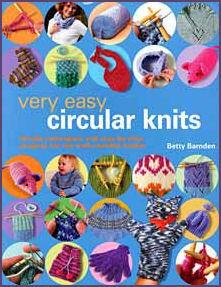 It’s Very Easy Circular Knits: Simple Techniques and Step-by-Step Projects for the Well-Rounded Knitter by Betty Barnden. It’s a combination beginning knitting/learn circular knitting book, and a cool project book too. I think even if you’d never knit a stitch before you might be able to pick up this book and start right off as a circular knitter. Call me weird, but that’s what I did! I just love knitting in the round. Even cooler though is the wide variety of circular projects included in this book. It touches on just about everything, from scarves and hats and bags and socks and pillows and gloves and mittens, and even sweaters. It covers color work, cables, increases and decreases, and shows with very clear pictures different types of cast ons. And that one very important thing about circular knitting that used to elude me when I started, the old “join, being careful not to twist.” There are good pictures in the book that show what this means. I haven’t knit anything in the book yet so I don’t know if there is anything major wrong with it. The patterns may be too simplistic for some, but I think it’s a really good introduction to a lot of the really cool things that can be done with circular needles. It’s worth a look! So I was listening to a back episode of Cast On with Brenda Dayne when she mentioned that Sarah Bradberry (whose site I adore!) has started a KnitWiki on her website. A knit-what-ee? you ask? A wiki is a community-run encylcopedia. Anyone can join the community and add to the body of knowledge, including patterns, techniques, discussion, history… you name it! With all the knowledge out there about knitting on the Internet, imagine what it would be like if all of that knowledge came together in one place?? Wow. Check it out! I’m still knitting away on my stripey baby blanket. Progress is slow because the stitches are so tiny! But still, I persevere. I’ll post a photo next time. Bye for now!